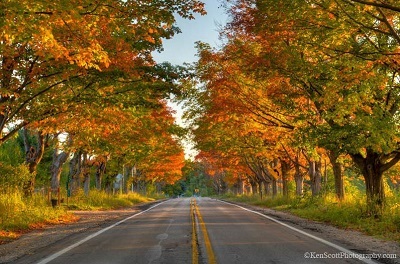 The Leelanau Peninsula is the "little finger" of Michigan's mitten, and one of the most beautiful sections of the Lake Michigan Circle Tour. Home to many wineries, gorgeous terrain, Lake Michigan beaches and smaller lakes, Leelanau County is a destination you won't want to miss. 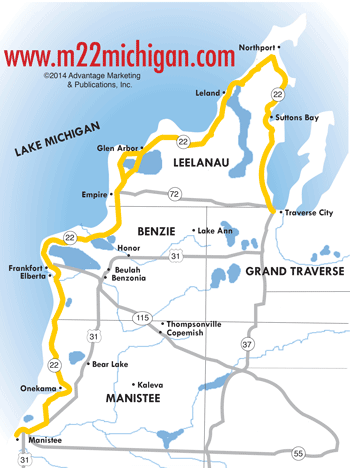 While taking the M-22 Scenic Drive, Leelanau County begins shortly after Frankfort and the Point Betsie Lighthouse in Benzie County, before reaching the city of Empire. The first place you will come across will be the small village of Empire, headquarters for Sleeping Bear Dunes National Lakeshore — named the most beautiful place in the United States by the viewers of Good Morning America. It's a place you must visit to appreciate how history and nature come together to form spectacular sand dunes. Read more about Empire here. You'll enjoy the quaint shops and variety of restaurants in Glen Arbor, just 15 minutes north of Empire. Home to Glen Lake and in the heart of the Sleeping Bear Dunes National Lakeshore, this township is a must stop along M-22. Read more about Glen Arbor here. Continue along M-22 up through the Leelanau Peninsula to Leland, a cozy little town about 30 minutes north of Glen Arbor. Visit historic Fishtown, a working waterfront with cute shops right along the docks. Grab a bite to eat at one of the restaurants or fisheries. Read more about Leland here. 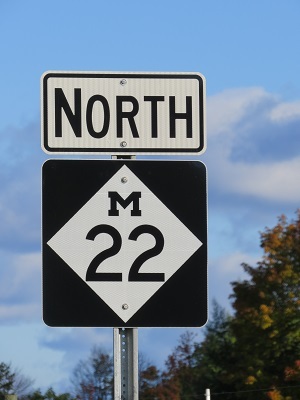 Another 20 minutes north of Leland, and you have reached the peak of M-22. Northport is an historic town known for its fine marina, beautiful parks, friendly downtown shops, scenic beaches and the annual Northport Dog Parade and Wine Festival. Read more about Northport here. Work your way south along the Grand Traverse Bay and in about 20 minutes you'll reach Suttons Bay. This very walkable village offers unique shopping and eating experiences. Several wineries and hiking trails are in the surrounding area. Read more about Suttons Bay here. Another worthy M-22 stop, Peshawbestown is a small community sitting on a Grand Traverse Band of Ottawa and Chippewa Indian reservation. Known for the Leelanau Sands Casino, the community is just four miles north of Suttons Bay. Leelanau County, as a peninsula, has many of its most prominent features on M-22, but there are some significant highlights outside the coastal highway. Leelanau County includes several islands, most notably the Manitou and Fox Islands. Ferries are available in many of the major towns along the west coast, and the islands remain a popular place to visit and explore. Lake Leelanau offers boating, fishing and scenic beauty, running over 20 miles down the middle of the county and stretching from Leland to the community of Cedar. Inland, Maple City offers some great dining options like fine dining at La Becasse Restaurant or Market 22 for the best pizza in the state.